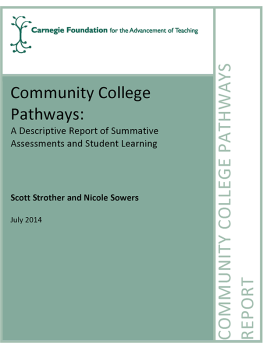 This report describes the comparative analyses from the Pathways summative assessment system. All items on the summative assessments were rigorously validated by field testing with over 500 members of a comparison sample who had taken a college mathematics or statistics course. Subsequently, all Pathways students took the summative assessments at the end of each term. This report describes analyses that use the development sample for comparison to Pathways students to assess their relative levels of knowledge. This report then describes the relationship between students’ summative assessments and their end-of- term grades. This analysis is to provide further evidence that Pathways students are not just receiving high grades and successfully completing the Pathways at a higher rate, but that their grades are reflective of actual learning, as corroborated by the independent measure.